**** I used 100 ml brandy and 275 ml boiling water. Alternatively, you can add some orange juice instead of the brandy. 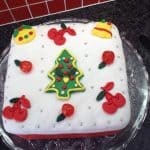 Ice the cake with a layer of Marzipan and a layer of white fondant icing. Store bought (Trumps) Over the cold cake baste some heated apricot jam then roll your marzipan thinly. Drape over the cake. Roll white fondant icing out and drape over the marzipan. Cut and trim your cake. Decorate with Christmas fondant cutouts.